A recent poll indicates people trust family and friends, and barely anyone else, for political information, which begs the question why when many families and friends shun political conversation. The answer may lie in the continuing and consuming culture war that has made people skeptical of everything, so they trust who they know, even if they disagree. 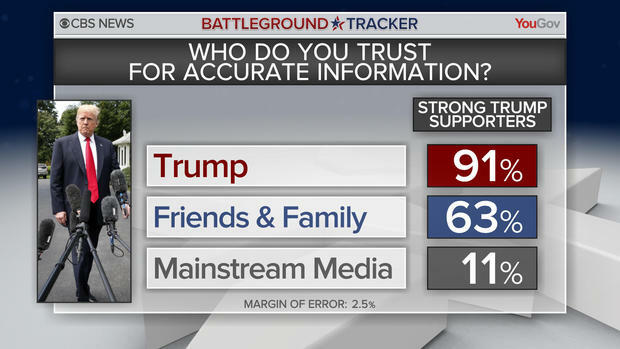 Politics may be verboten at family dinner tables and social occasions, but a recent poll shows the most trusted sources of political information are family and friends. Super PACs and candidate political campaigns are the least trusted. Seventy-one percent of respondents in the online poll conducted in August say they trust friends and family a lot or somewhat, dwarfing the news media in second place at 46 percent. Trust in businesses registers at 44 percent, the Democratic Party at 39 percent and the Republican Party at 35 percent. Super PACs trailed at 17 percent. A key finding showed only 42 percent of respondents trust major companies to behave ethically, which is down from 47 percent in a similar poll in 2017. Only 9 percent say they have a favorable opinion of major companies, which barely tops the 7 percent favorable rating for the federal government. Conducted by Morning Consult for the Public Affairs Council, the poll found only 10 percent of respondents have a favorable opinion of President Trump’s tweets, 17 percent don’t understand his criticism and 41 percent say it doesn’t change their opinion. Interestingly, slightly more Democrats admit reading Trump tweets than Republicans. If family and friends are who we consider most trustworthy, why do family members and friends find it so hard to talk about politics, especially when they fall into different ideological camps? There probably isn’t a simple answer. Most likely the answer has something to do with shared experience, if not shared perspective. This graphic illustrates the irony of trust in political figures who routinely lie and trash the news media and political opponents. Families have a common heritage and history; friends a common school or set of interests. Achievement or lack of achievement can be a binding life experience. People tend to trust what they know. Family members may be disagreeable and even unreliable, but family members may know when not to trust Uncle Bud when he criticizes a particular political person or party. The same holds true for friends whom we may trust even if we disagree. The troubling part about the Morning Consult findings, which echo other similar findings, is that people largely distrust every other source of political information. A significant percentage of Americans believe news outlets publish inaccurate or biased stories. A low opinion of corporations, political parties and political institutions such as Congress have been acknowledged for some time, and the lack of trust in them continues to decline. Ironically, this is the ferment that breeds “strong men” who constantly poke and mock the news media and political opponents. In an atmosphere where people have few people they trust, someone who says they are right not to trust the news they read or what politicians say can somehow appear trustworthy. The Morning Consult poll reveals low regard for Trump’s tweets, yet the President retains an unshakable base of support that trusts what he says, even if they dislike how he says it. One of the best explanations for the epidemic of distrust among Americans is the continuing culture war, which itself reflects changing demographics and evolving political attitudes. Increasingly, people don’t trust information from the news media or the mouths of politicians with which they disagree. It’s like Rudy Giuliani famously said, “Truth isn’t truth.” If you believe homosexuality is a lifestyle choice, you won’t trust information or political views that talk about it as an innate orientation. Which brings the conversation back to the trust in family and friends. People apparently weigh their personal relationships with family and friends higher than agreement or disagreement with their views. You trust your brother-in-law because he takes care of your sister and their family, not because you agree or disagree with his political view. You might think he is a political dolt, but he is your family’s political dolt. It’s no surprise then that one of the most popular shows on Fox News is named Fox & Friends.